I visited the farmers market this weekend, walking the block between my home and the market at top speed, trying unsuccessfully to stay warm in the whipping winter winds. I love that so many of the farmers markets here in Philadelphia have decided to hold winter markets, most every other week instead of weekly and for just an hour or two so the farmers don’t turn completely into icicles. Being able to still buy local sweet potatoes, onions, broccoli, kale, and apples directly from their growers is such a treat and a sure cure for the winter blues. 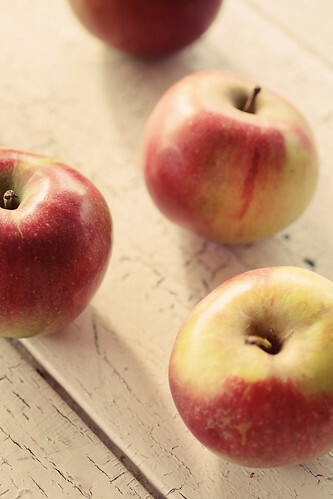 I purchased eight large russet-hued ‘Winesap” and a few bicolor ‘Honeycrisp’ apples, having a hard time counting out my bills with my numb fingers. I didn’t really have a plan for them at that moment, but given apples keep for quite some time, I thought I’d just store them until I had a grand idea. Once I got home though, I realized I didn’t want to dream up a wild creative dish for them. Instead, all I really wanted was a simple delicious traditional Apple Crisp. 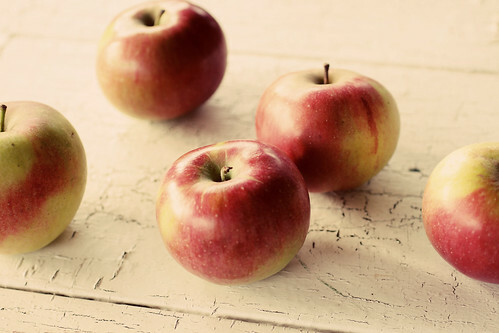 Place the sliced apples in an ungreased 9×13 inch pan. Mix the white sugar, 1 tablespoon flour and ground cinnamon together, and sprinkle over apples. Pour water evenly over all. Bake at 350 degrees F (175 degrees C), uncovered, for about 45 minutes. Entry filed under: Recipes, Sweet Treats. Tags: baking, cooking, dessert, food, recipe. Love, love, love apple crisp. And winter Philly farmer’s markets! The one up by Temple closed up shop for the winter, but I just passed by Rittenhouse’s beautiful showcase yesterday. Yum! 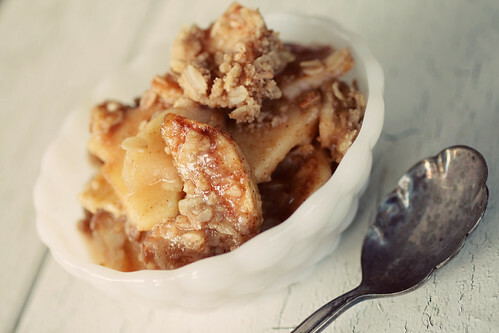 love apple crisp….but I’d have to add some ice cream! 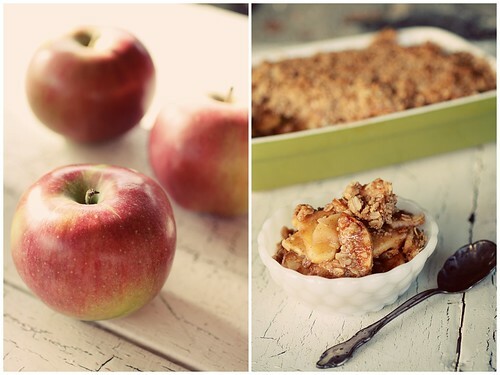 Not much beats a nice warm apple crisp–especially one with yummy winesap and honey crisp apples! This makes me hungry, yum yum.. Perfect with vanilla ice cream. Delicious! Your apple crisp looks wonderful. I just wish I didn’t dislike peeling and coring apples so much! I have a great apple crisp recipe, too, straight out of the Joy of Cooking (or is it the New Joy of Cooking). This one has all the sugar and spices in the crisp topping – put sliced apples in the dish (I leave the peeling on), sprinkle on topping, tap the dish on the counter a couple of times so the flour, sugar and spices can drift down through the apples and cook. So easy! Now I’m going to have to make it for dinner tonight. Mmmm. I make a similar one, but add in fresh cranberries for a colorful, sour contrast. So easy, so delicious! When I make a crisp, I like to double the topping blend (except for the butter) and stick half in a jar for next time. It makes it easy to do a quick and small crisp when I feel like a treat after dinner. While it doesn’t take long to mix the dry ingredients, it is nice to have it already mixed in the right ratio. That looks delicious! I just made a quince fruit crisp the other day, I’m always looking for seasonal recipes. Thanks for the tips! This looks delicious, I so have to try it! I love crisps with all kinds of fruit but there is nothing like apples when it comes to baking. They’re marvelous. Made this last night for a group of women friends and everyone loved it. With soup and a salad on a cold winter night, it was perfect. Thanks, Jenny. IF you ever have applecrisp leftovers use them for breakfast the next day. Take some crisp and mix it with a cup or so of steel cut oats, cover with milk and put in the fridge overnight. The next morning you’ll have the most delish breakfast waiting for you. Warm if want or eat cold. I make crisps and freeze them in small portions just for this. My kids don’t understand why their friends dislike oatmeal! I love Apple Crisp!! I can not wait to try your recipe! I bought a case of apples a couple weeks ago and I think this means I need to turn some into Apple Crisp. I almost want to ration them in the winter, but I guess warm crisp (especially a la mode) is a near perfect winter comfort food! I make a lot of apple crisp–a reheated bowl of it with a little milk makes a wonderful winter breakfast. Almost 50 yrs ago my German grandmother told me that if it’s good no one will notice you didn’t peel the apples. She was right, and haven’t peeled one since!I add a good handful of raisins and seldom need any sugar on the fruit, just cinnamon. Topping–butter flour, dark brown sugar, and oatmeal, mixed until crumbly. Usually have about as much topping as fruit, and the family fights over it! a quantity of improvements over LCD including much deeper black levels (better yet than Plasma) because of an incredible contrast ratio of merely one,000,000:1. 50 inch led light bar mounts The status bar also contains notifications for brand new messages, missed calls, and upcoming events. ABS, are some of the choices for the casing with the light bar. The benefits for that users of LED light bars cover a large area appealing:. YUM! I just posted my dad’s recipe for beet greens on my blogger, but I’m still hungry and this looks dang good. All text and photos © 2007-2012 Straight From the Farm. Contact straightfromthefarm (at)gmail(dot)com to ask for permission before reprinting in any format. Fill in your email address below to get new posts sent to your inbox so you'll never miss a great recipe! Elizabeth on Forget the Tahini!